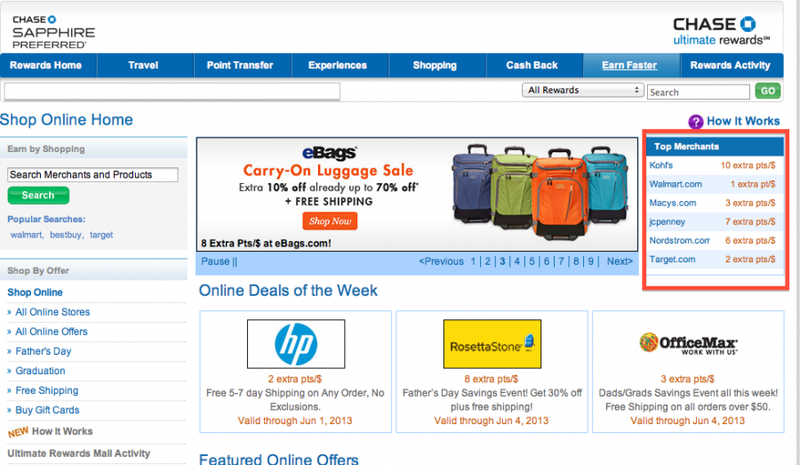 Video SRQ: How Does the Ultimate Rewards Shopping Portal Work? “I just signed up for the Chase Sapphire Preferred card, but I’m a little confused about the Ultimate Rewards shopping portal. Is this like Ebates, where you try to click through from this website before making a purchase? I think what has me confused is that people often talk about earning 3 or 4 cents when making travel purchases from Ultimate Rewards, and I can’t tell if it’s just because they click through before booking a flight or hotel (on say Expedia, Orbitz, etc.) or if this is for folks who redeem Ultimate Rewards points for travel with the added bonus? Welcome to the Ultimate Rewards club! Using the shopping portal is really simple and can help to give your points balance a nice boost. In order to make a purchase through the portal, first log into your Ultimate Rewards account and click the “Earn Faster” tab on the top right that will take you into the shopping portal. Once in the Ultimate Rewards Mall you’ll see the top merchants and their earning ratios. The Ultimate Rewards Mall is really lucrative in general, but you always want to check other portals to make sure the Amerian AAdvantage or Delta SkyMiles shopping portals aren’t going to give you a vastly better earning ratio for points or miles per dollar spent. Usually on the first of each month there will be different earning ratios for the various retailers so you should use sites like EVreward and rewardsDB that will compare earning ratios for all the different shopping portals so you can maximize the amount of points or miles that you’ll earn on your purchase. The portal will tell you how many points per dollar you will receive for a certain merchant as well as current deals. Once you’re in the shopping portal you can search for your preferred retailer. Let’s say you’re looking to make a purchase from Nordstrom.com. 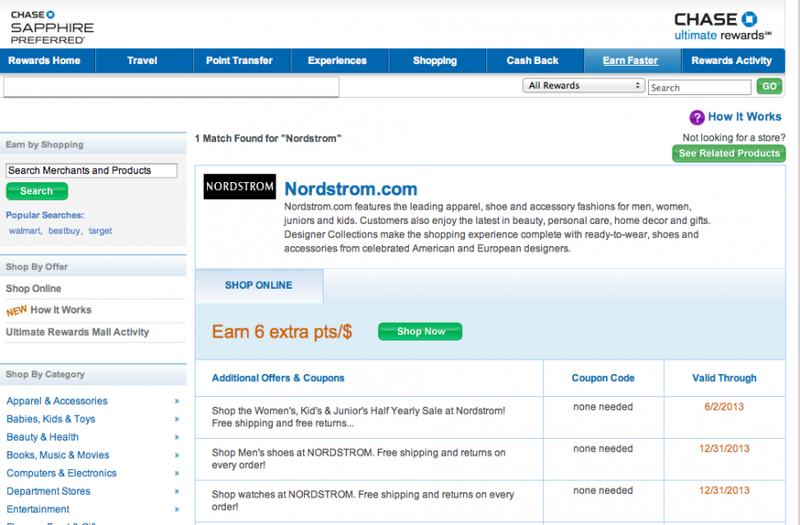 Enter “Nordstrom” in the search box and the merchant will come up as well as the number of points per dollar that you will earn on the purchase. If you then click the link for Nordstrom you will be redirected to Nordstrom.com. You won’t see anything different once you are on the retailer’s website, but by using the portal it puts a cookie on your computer and when you check out, as long as your purchases are eligible, you will get a nice little deposit in your Ultimate Rewards account in about a week or so. I try to always use a Chase card when using the Ultimate Rewards shopping portal, which isn’t absolutely necessary, but if for some reason a bonus doesn’t post Chase representatives are much more willing to give courtesy postings if you used a Chase card. 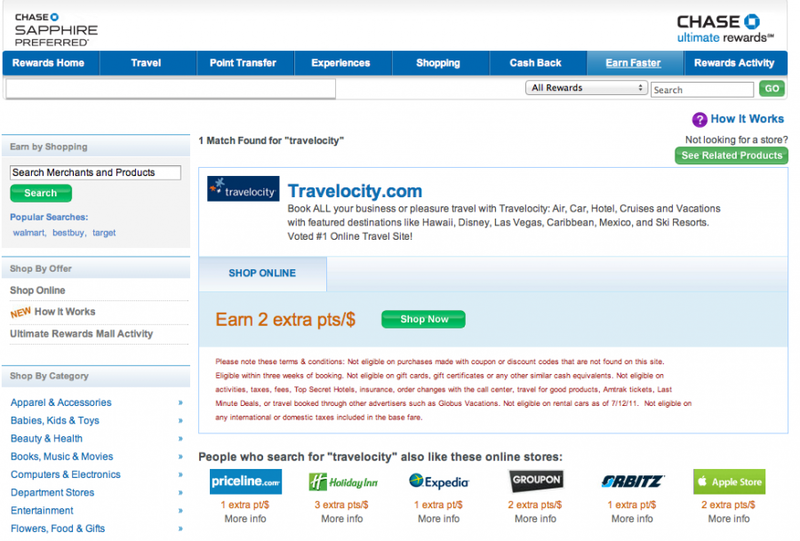 Travelocity earns 2 pts/$ while Orbitz and Expedia only earn 1 pt/$. When it comes to booking flights through the Ultimate Rewards portal, right now you should book using Travelocity because you will earn 2 points per dollar you spend. Those two points are on top of the two points per dollar you’ll be earning by paying with your Sapphire Preferred as well as the 7% points dividend you receive at the end of the year (which you’ll earn on all those bonus points as well). Essentially you’ll be getting 4.28 Ultimate Rewards points per dollar spent on any travel booked through Travelocity because you’ll also be getting an additional bonus for booking through Ultimate Rewards. If you book through Orbitz and Expedia you only receive 1 extra point per dollar through the portal, so 3.21 points per dollar all told. You will still earn elite status and get upgraded on flights when booking through sites like Orbitz and Travelocity, but you may have some difficulty if your flight gets cancelled. The airline could tell you that you must contact your travel agent in order to get rebooked, but it usually isn’t too much of an issue. With hotels it’s a bit of a different story. If you book a hotel through one of those travel sites you probably won’t earn elite status credit or points for the nights you stay and the rates you book. Hotels generally try to make you book directly through their website in order to earn credit with their loyalty programs. Some people have reported still earning points and elite credit and enjoying their elite benefits on stays booked through online agencies, but in general I would not expect to have your stay booked through one of those online travel agents count towards your elite status. Using shopping portals is such an easy way to earn extra points and miles so if you’re not already shopping through portals, definitely check it out and keep it in mind for your next online purchase. Hopefully this answered your questions, but if not please comment below or tweet me @thepointsguy!